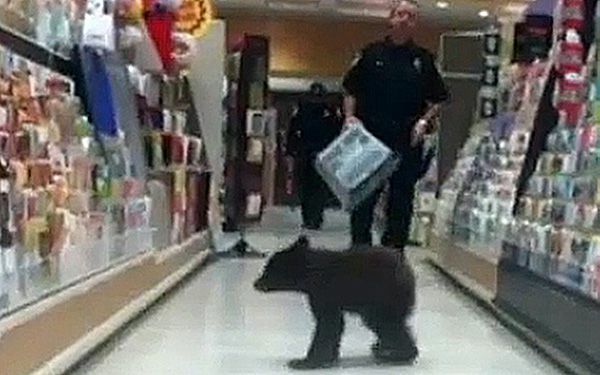 A black bear cub has been found wandering the aisles of a drugstore. Now the female cub will be raised with the goal of releasing her back into the wild. 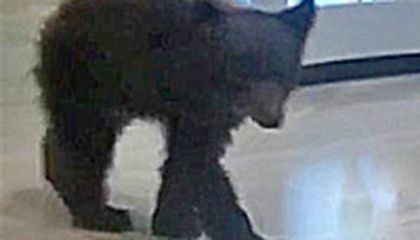 Police scooped the bear into a shopping basket Sunday. It was at a Rite-Aid store in Ashland. Shoppers took video on their smartphones. The Oregon Department of Fish and Wildlife said the cub has been taken to the PAWS Wildlife Center. Director Jennifer Convy says the staff cares for bears with hands-off methods. Those are designed to mimic conditions in the wild. They also maintain an animal's fear of people. The department says it hopes to release the bear in southern Oregon next spring. The cub weighs 13 pounds. Veterinarians estimate it's a couple of months old. Biologists don't know what happened to her mother. The local bear population is healthy. So bear sightings are common in the area. Initially, authorities said it would not be possible to return the cub to the wild. That's because of her contact with humans. Now the veterinarians at PAWS feel she has a chance with the right kind of rehabilitation. The story is all about a bear wondering in rite aid . It happened in Ashland Oregon . They put the bear in Paws center they are planning to bring the bear in paws center they keep the bear tell next spring to release it back in the wild. When I read this article, my heart immediately felt warm. You see, this summer I went to Yellowstone. I saw a few bears there. my brother got scared but, I loved them. I have liked bears ever since. What is the bear doing? Is the shopping for a friend? Is the bear in the gift wrapping department? I hope the police officer. Did the police officer get hart trying to get the bear out of the Rite-Aid or did the Fish and Wildlife come and get the bear out of Rite-Aid. But,did any people get hart in the store. I wonder If it was hard for the police to bear all that weight. You know, when they had to carry the bear out of the rite aid. Ketchikan, Alaska had the same problem. A bear got into Tatsuda,s produce store and got into the lettuce. The State Troopers took care of that, but they didn't do any experiments on it. The troopers just let it out the back door. What I would have done was let it eat the rest of the food it contaminated. I thought this was funny. I thought so because of thinking about the details like, how did the bear even get into the store? Did he just walts into the store like"Hey guys, I'm just here to get some band aids. I'll be out in a moment." Or did he get in through a window or something like that. Also, I think the reactions of the police and people around the situation would be funny. It must have been hard the police to BEAR all of that weight to carry it out the store. I wonder what they would have done I it was an aggressive kind of bear. I don't now why a bear wondered into a drugstore.